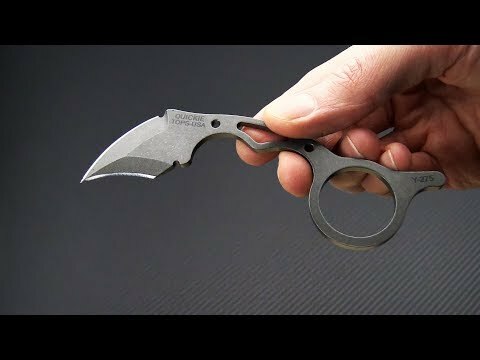 Designed by Leo Espinoza with law enforcement in mind, the TOPS Knives Quickie is a “3-finger” Karambit, meaning the 3rd finger from the blade should be placed in the hole. This specialized design leaves a nub after the ring, offers the user some ability to use the hand while still holding the knife. This makes a great options for LEO or Military personnel in CQB scenarios. Concealment and ease of use were of paramount concern and the 1/8” thickness, short overall length and low profile sheath and clip deliver in spades. On or off duty, the Quickie makes a great back-up option for self-defense. Brand new directly from TOPS Knives, USA. Blade: The Quickie is made from differentially heat treated 1095 High Carbon Tool Steel offering a blend of cutting performance and toughness. The Tumbled Finish of this Karambit-style blade is made from thin yet durable, 1/8" blade stock and sports a dual saber grind that offers excellent durability, a piercing point and bi-directional cutting performance. Coming in at just 5" overall the Quickie is easy to carry on or off duty. Handle: The skeletonized, full tang construction keeps the knife light weight (sub-1.5 oz) for optimal carry. The ring goes on the middle finger with a nub for the index finger which allows for retention of the knife while still being able to use and handle other items. The slim, lightweight and compact construction makes this knife easy to carry concealed until you really need it. Deploys fast from the custom kydex sheath. Sheath: Comes with a custom molded kydex sheath equipped with metal spring clip for belt carry and eyelets for other carry options.